There is an old metal acolyte in the Skryre picture. So that answers that, they are just going with what they have... Kind of a shame, but with a good solid book I'll at least feel safer converting Skaven. I am excited for Skaven. Moulder having a keyworded hero makes me hope they found way to make more hero options for them. Their allegiance is solid, not crazy, but that's fine. Sad no full Eshin previews, but man does the book seem overflowing, love it. I have heard that sylvaneth definitely getting new scenery and three new endless spells with their battletome. Source is not saying anything about kharadron overlords which makes me suspicious it might be something good. No news about Sylvaneth with bows? Where does this bow thing come from? Sylvaneth underworlds warband has a dude with a bow. Did anybody else had problems with accessing this site today and yesterday? As for the FEC and Skaven releases - I'm still surprised they came back yo FEC ans even gave them a boxed game. Great. As for the Skaven i still believe that they deserve more than a battletome + some spells. Each major Clan in my opinion should receive its own battletome and models. Maybe this will happen in the future. What do I want from LVO? 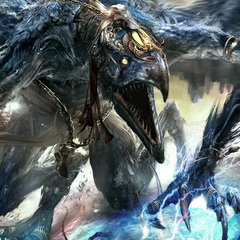 Carrion Empire would be enough to be honest and still we should feel satisfied. But since they say there is more, than well, a sneak peak of Darkoath will be great. Not really treating Underworlds warbands as part of AoS so not really intrested in that. Just one more thing. Past Stormcast releases made me expect more from a faction update or second wave. If each year Stormcasts receive several new models, abilities, spells, battletome then I would be really disappointed if the only thing Fyreslayers or Ironjawz receive is a "3 spells and scenery" treatment. Those and some other factions have so little units that isn't even funny compared to Stormcasts or few others. Please tell me they are getting rid of the wyldwood overabundance! Those damn woods are a playability nightmare. I have heard that sylvaneth definitely getting new scenery and three new endless spells with their battletome. More trees. That kill you when you run over them? That fill up the board. And got my stonehorns stuck for a whole edition before they could fly or I knew they could climb over them. With that name... advocating for less Trees? With Wyldwoods as they are there are never any actual trees on the board! Just bases. Currently none that I know of! Only rumors I know are the community crafted ones regarding the Duardin ruins baked into the troggoth and dankhold kits. Each major Clan in my opinion should receive its own battletome and models. Maybe this will happen in the future. That does not seem likely to ever happen. Maybe if they decided to break Skaven off into it's own full Grand Alliance - but they appear to be solidly within the Chaos camp for AoS. A full battletome for every skaven clan would make them comprise roughly half of the entire Chaos Grand Alliance and that feels very out of place given that they have expressed many times that the Horned Rat is the currently the lesser of all the Chaos gods. They simply did not set up Skaven within AoS to take on such a large role that each clan should warrant their own distinct model range and dedicated battletome. If they had rolled Skaven into the Destruction Grand Alliance rather than Chaos then multiple Skaven books would probably have made more sense. I do wish that they had put made new kits for the Skaven with this release though. They have some plastic kits that could benefit from being reworked and a lot of finecast that they could have removed. But a good book update is nothing to scoff at and this new book sounds like it will be pretty expansive. Hopefully it delivers most of what Skaven players want in regards to rules and army structure. Honestly, having all of the clans rolled together into a larger allegiance, but with the option to play specific clan allegiances should provide for more variable builds overall. There is also a lot of modeling potential to be had with a structure like that for hobbyists that like to take on conversion projects. Maybe he has issues with imposters? GW could give Skaven an army for each Clan - the problem is that would give them a large number of armies to support. A new Clan Pestilens model only interests pestilens players not moulder or others. So you'd quickly end up with a lot of armies to support and update and it would get out of hand! All other points are very sensible but this feels as a wrong conclusion. The great horned rat is the lesser in the great four. But his chosen race is spread out across every realm, so regardless of his position compared to nurgle, tzeentch and Khorne his followers are plenty enough to develope different cultures. And if those styles influence playstyle (like the great clans already have) it could be worth it to investigate as a separate faction for GW. Still not going to happen but not influenced by the narrative power difference between those gods. You could make the same argument for every race and the various subfactions within battletomes - such as Deepkin Enclaves, Sylvaneth houses, Daughter's of Khaine temples, Fyreslayer lodges, etc. Honestly, the described system for the Skaven battletome sounds more flexible and diverse than what those other battletomes use to add that layer of diversity. Even the major chaos gods have their followers spread across all of the realms and a large variety of mortal followers that one could argue diversify based upon the realms they are in. I really like Skaven, but they don't seem to be a unique snowflake compared to any other race in regards to why they should have distinct clan books rather than a single unified tome that still provides them diverse build options. Yeah, not endless spells. I wonder if Dwarfs could get a release with no models at all. Maybe a scenery piece. Perhaps a reimagined anvil of doom or something. I'd image what ever they got would be some kind of forge based. If they don't get anything new, I just hope they don't forget the units they've loaded to the ironweld arsenal. 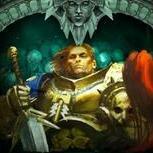 With Tzaangors in Beasts of Chaos, GW doesn't seem to be against the idea of models living in two books at once. Now that the new skaven book is a rebsorbing Clan Pestilins and likely ending their own battletome, I wounder what the odds of that happening to BCR are if Ogres get a book? Last 2 Underworlds warbands (Sylvaneth and Kharadron). These are rumoured to come with the 1 week release treatment. Endless Spells, Terrain, Dice and a Battletome. Makes sense, both factions need a quick update. Wider Slaanesh release including battletome and probably a codex. General 40k chaos update. New Abaddon, new generic chaos marines, reboxing of black fortress traitor guardsmen, perhaps 40k beastmen too. It’s possible some of these things may be released as kill team boxes to gauge interest going into 2020. Seeing as how they’re doing these quick battletome updates, I wouldn’t be surprised if Ironjaws and Seraphon got a battletome update. Perhaps with the same terrain/endless spell/dice treatment. They both need a tweak. I think those are the most likely things to happen this year. I’d like to see some updates to the very old Skaven range with this new book, but I’m happy to wait a bit for all that. 1 major demons release that works for both. So perhaps there’s room for 1 more major AOS release…. Could be new skaven models, could be fyreslayer updates could be elves/free-peoples/skygrots (though I think we’d have heard more rumours about any of these by now). Yes, I did - kept saying site not available, but seems ok now. While not wanting others to suffer, but somehow I feel better knowing I wasn't the only one.